This project began when Mr. & Mrs. “C” made the trek from Buckeye Arizona to visit our Peoria Arizona showroom. They were in the process of planning and building their dream home. After several trips to our showroom and a vast number of prefinished hardwood flooring options, we quickly recognized that they wanted to go the full custom route which of course something that we thoroughly enjoy! They were interested in both wide and long planks, and we couldn’t find anything to their liking until the Carlisle Wide Plank caught their eye. Numerous questions arose after they made their decision. How wide can we go? How long can these boards go? We requisitioned several species, and samples from Carlise and the homeowners chose Eastern White Pine which comes in widths of 20” or more and the lengths were 12 to 16 ft long. We placed the order with Carlisle which took 8-10 weeks. Once we received the eastern white pine, we then delivered the hardwood planks to their home and regulated it so that it would acclimate properly. Once we were certain that the hardwood had adjusted properly to the Buckeye environment, we nailed down a plywood subfloor working closely with the general contractor to make sure all wood to tile transitions matched up perfectly. After we finished the sub floor, it was incredible to see the wide planks go down. The lengths were stunning! We then sanded the pine planks to specification and went through a colorizing process with the homeowners. The clients had a ranch style home with aged graying effect on their cabinets. They chose a Bona Grey Stain with Bona Oil based finish in satin, and the overall look of this Eastern White Pine is fabulous and will only get better with time. We always enjoy the custom process that comes with installing a one of a kind floor and learning what the homeowner's vision is. 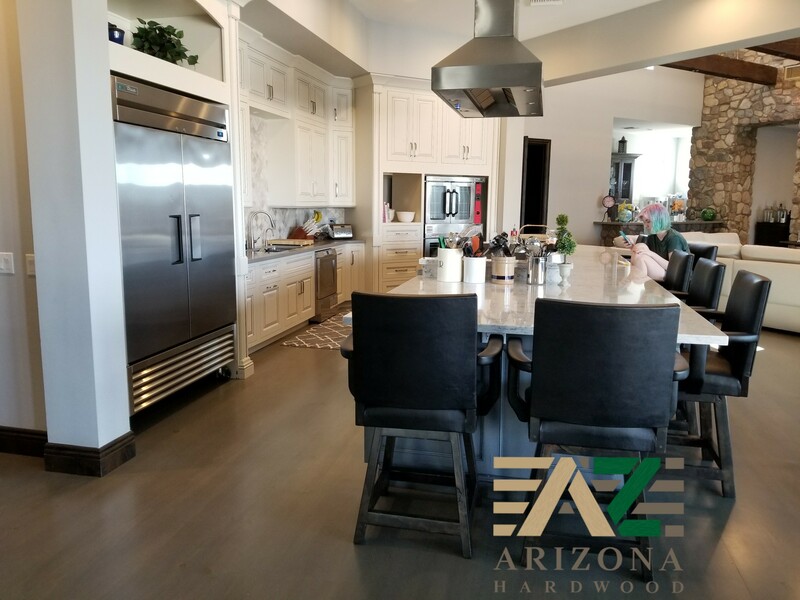 A special thanks to Mr. & Mrs. "C" for allowing Arizona Hardwood Floor Supply to be part of their project, it was genuinely a pleasure. It just goes to show there is a need for custom hardwood floors in the west valley!